It started out as a fun-filled four-day cruise from Galveston, TX to Cozumel, Mexico. It turned out to be the Cruise to Hell and Back. When the Carnival cruise ship Triumph experienced a crippling engine room fire one day before it was due back in port, it would set off a PR nightmare for Carnival, a company still licking its wounds from last year’s Costa Concordia disaster, and not too far removed from a very similar disablement of its ship Carnival Splendor in November 2010 All three of these incidents have received intensive media attention, with the Triumph and Splendor accidents playing out in dramatic news stories being reported over a period of several days. As I looked at the monitor in the gym last night, the graphic on NBC News read: Nightmare at Sea. All the positive PR in the world can’t overcome a headline like that. One question that inevitably comes to mind is: Why? Although they are very rare, disabling engine room fires on cruise ships have happened before. In the wake of the Splendor incident, Carnival set up a Fire Safety Task Force to look at the issue. This is a classic PR tactic, setting up a Blue Ribbon Commission to examine an event and recommend solutions. The more heavy hitters you can get on the commission, the better it looks. It gives key audiences confidence that we have left no stone unturned in our quest to understand what happened and prevent it from ever happening again. Unfortunately for Carnival, it happened again. A disturbing reality for cruisers is that engine room fires do happen and you may be stuck at sea for five days without power, lights, air conditioning, toilets and other “amenities.” While this type of scenario may be familiar and not alarming to crusty old sea dogs, it’s nearly unfathomable to the thousands of “vacationers” who signed up for a stay in a resort that just happens to be at sea. In order to increase the safety of passengers at sea, the International Maritime Organization has mandated that ships built in 2010 and later, have two completely separate engine rooms and electrical systems. If one propulsion system catches fire, you can just start-up the other one. 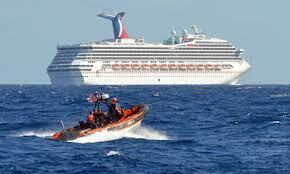 But this only applies to new ships and not to the Carnival Triumph, which entered service in 1999. This makes one wonder if discerning cruisers will begin to seek out newer ships with redundant systems, forcing cruise lines to heavily discount travel on older models. But in the words of another crusty PR dog who shall remain anonymous, “you ain’t seen nothin’ yet,” when it comes to bad PR for Carnival. As I write, anxious relatives are massing on a dock in Mobile, AL, waiting to comfort their sobbing and traumatized kin, who will stream off the ship full of horrific stories they are only too eager to tell to a drama-hungry media horde. The media is already salivating at the thought of bellying up to an all-you-can-eat buffet of first person “survival” stories, while for Carnival’s PR team, it’s just the beginning of a nightmare that may go on for months or years. And for a cruise industry that has all of its marketing muscle behind promoting a fun, carefree vacation at sea, it’s another black eye that has folks questioning its practices and credibility. Make the affected customers happy at almost any cost. The horror stories that will come off the ship will be what hurts you the most. If Jim and Barbara from Des Moines aren’t happy about the way they’ve been compensated for this ordeal, their stories of pooping in a bag inside a sweltering cabin will just get louder and more exaggerated. You need to do what it takes to get them on your side. Announce a dramatic and serious initiative to address the problem. The Blue Ribbon Commission usually works well, but because they’ve already tried that once, Carnival now has a credibility problem. They’ll need to add some star power to the effort to give it credibility. Make sure your side of the story gets out there. The media does a good job amplifying the message of detractors as they pile onto a story. Don’t let falsehoods, exaggerations, unfounded accusations and the like go unanswered. Beef up your PR team so that you always have someone available to give your side of the story. Define your messaging. Before you can tell your side of the story, you need to decide what that story is. Pull together facts that demonstrate everything you did to prevent the problem, plan for it, implement your plans and most importantly, comfort the customers on the ship and communicate what was happening to their loved ones. Find some heroes. In the Costa Concordia tragedy, Costa and its parent Carnival took a beating because their top executive on the scene, the Captain, abandoned ship before the passengers had all gotten off. But several of their crew emerged as heroes, saving lives amid the chaos and helping to balance what could have been a very one-sided story. Undoubtedly, there are heroes on the Triumph and their stories should be told. Time heals all wounds. Like other companies that have faced public relations disasters, Carnival should lie low for a while until things calm down. Marketing during a crisis is flushing money down the toilet. Better to put the marketing machine on pause and then come roaring back when it’s safe to do so. I have no doubt that Carnival will survive this latest mishap. A good PR strategy will help them get past it faster and come out stronger on the other side. Update: Apparently the Triumph hasn’t finished reaking havoc.